Potnia Theron (Ἡ Πότνια Θηρῶν, "The Mistress of the Animals") is a term first used (once) by Homer (Iliad 21. 470) and often used to describe female divinities associated with animals. The word Potnia, meaning mistress or lady, was a Mycenaean Greek word inherited by Classical Greek, with the same meaning, cognate to Sanskrit patnī. Homer's mention of potnia theron is thought to refer to Artemis and Walter Burkert describes this mention as "a well established formula". An Artemis type deity, a 'Mistress of the Animals', is often assumed to have existed in prehistorical religion and often referred to as Potnia Theron, with some scholars positing a relationship between Artemis and goddesses depicted in Minoan art and "Potnia Theron has become a generic term for any female associated with animals." Many depictions in ancient art present a widespread ancient motif of the mistress of Animals, showing a central figure with a human form grasping two animals, one to each side. 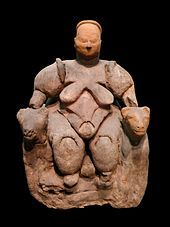 The oldest depiction has been discovered in Çatalhöyük. An early example of Potnia theròn is situated in Museo civico archeologico di Monte Rinaldo  in Italy: plate illustrates goddess that wears a long dress and holds hands with two lionesses. Wikimedia Commons has media related to Potniai theron. ^ a b Fischer-Hansen, Tobias; Birte Poulsen (2009). From Artemis to Diana: the goddess of man and beast. Museum Tusculanum Press. p. 23. ISBN 978-8763507882. ^ Chadwick, John (1976). The Mycenaean world. Cambridge University Press. p. 92. ISBN 978-0-521-29037-1. ^ Burkert, Walter (1987). Greek Religion. Harvard University Press. p. 149. ISBN 978-0-674-36281-9. ^ "Monte Rinaldo - Rete Museale dei Sibillini". Retemusealedeisibillini.it. Retrieved 11 April 2018.